Mazal Dadon received her freedom recently from her recalcitrant husband, Yaron Atias, who for many years had refused to grant her a“get,” or Jewish writ of divorce. The entire country celebrated this happy event that touched all of our hearts. How sad that an entire country waited for her to receive a get, as if we were waiting for a sign from heaven, instead of the endorsement of one little man. The excitement generated by this miraculous event is nothing more than a show of contempt by the entire Jewish community. How can we live in a society in which such a normal occurrence has turned into such a difficult task that we view it as a miracle from heaven? At Yad La’isha, we deal with tragedies of this sort on a daily basis. We dig down as deep as we need when dealing with a husband who refuses to release his wife, and persevere until she is finally freed. We celebrate the success of one woman as a way of offering hope to those who are still chained. Our staff of strong warriors approaches each new case with renewed energy so that we can help each woman achieve freedom in as short a time as possible. Try to imagine 150 Mazal Dadons, 150 agunot (chained women) who’ve been refused a get. This is the number we represent every year. The youngest aguna we’ve helped wasn’t even 20 years old. She was married only two weeks, and waited for a get for two years. Our oldest aguna, who was 78, had suffered a long life of violence. For her the idea of being in a loving relationship was so far from reality. Another aguna, who is 35, fled from her home where she’d suffered for three years at the hands of an extremely violent husband. Her biological clock is ticking and she can only dream of one day holding her own child in her arms. She is still being held captive by her recalcitrant husband. In some cases, the husbands live in Israel and claim they are refusing to offer a get because they want to pursue “shalom bayit.” One man who is living with another woman claims she is just a flat mate. Another get-refuser is registered on a dating site with the following description: divorced man looking for a new start. In some cases, recalcitrant husbands flee overseas to countries where they can disappear, remarry and bring more children into the world. They get on with their lives, while their chained wives are left behind, frozen in time and place. There are apparently no grounds for granting a halachic divorce, no way to force a man to release his wife. The get is like a dream that is as distant as ever. I am constantly being asked how we can stand working day after day for the release of chained women, and not become depressed by the evil we encounter. For we are so powerless compared with the bureaucracy. We do not have the backing to challenge the cynical way Halacha is being interpreted. How can we watch as husbands are allowed to do as they choose, and leave their wives chained to them. And that is why when we experience a success, it gives us and all the other women hope that they too might one day reach the light at the end of the tunnel. Just last week, another woman – we’ll call her A. – received a get after waiting 12 long years. She approached us only a few months ago, almost ready to give up hope. She’d been fighting for freedom for 12 years all by herself with no support. She had no backing from members of Knesset, or TV appearances. She was completely on her own, like most agunot are. When we first met with A., only one small kernel of hope remained within her, which she used to ask us for help. Of course we immediately picked up the reins and continued fighting the battle for her. When her husband showed up at the rabbinic courthouse accompanied by our social worker, A. thought she must be hallucinating. Only when the get was physically placed in her hand, did she dare to believe that her dream had turned into reality. Despair turned into joy and failure turned into hope. 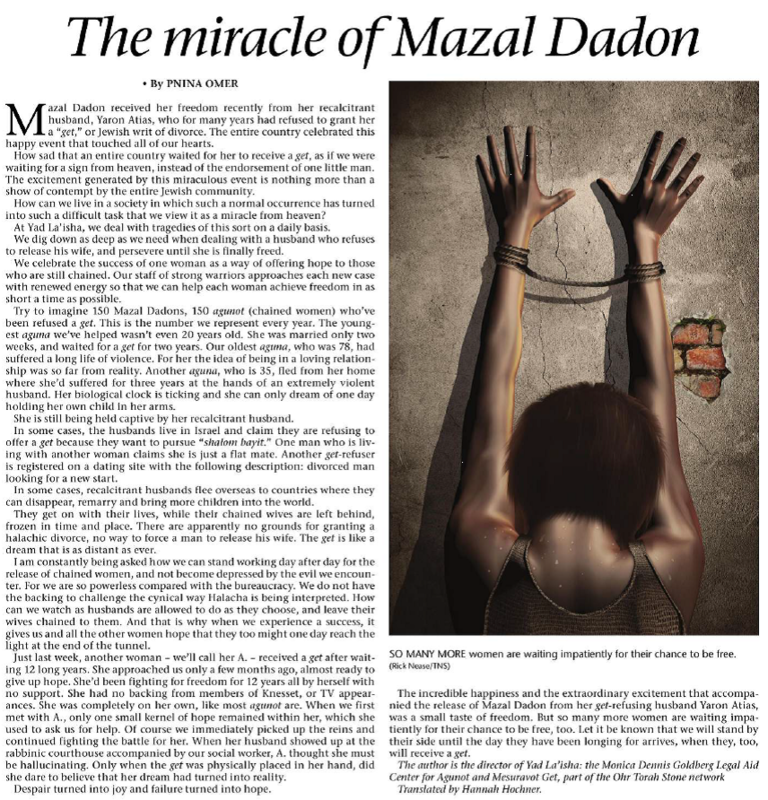 The incredible happiness and the extraordinary excitement that accompanied the release of Mazal Dadon from her get-refusing husband Yaron Atias, was a small taste of freedom. But so many more women are waiting impatiently for their chance to be free, too. Let it be known that we will stand by their side until the day they have been longing for arrives, when they, too, will receive a get.